Kundalini Yoga is a practical technology that meets you where you are and takes you where you want to go. It is a perfect form of yoga for beginners to advanced and a great match for our current times. With our busy schedules we want a practice that gives us direct experience of an elevated consciousness effectively and efficiently. Kundalini Yoga will do just that and more. We offer Mindfulness Tours, Workshops and Corporate Wellness Programs that are unique, powerful and transformative for individuals and groups alike. From Team Building Workshops to a Personal Wellness Retreats designed to gently Detoxify, Rebuild & Strengthen the Immune System, UNBEATEN PATH TOURS & YOGA offers programs that work for YOU, YOUR GROUP or EMPLOYEES - privately - just for you! ​We create custom, dynamic and impactful tours & workshops for corporate groups that connect your team to the insight of nature, architecture, landscape & ecology with the many facets we face in business. Our Workshops and Retreat Tours are designed to create Corporate Consciousness = a work environment that aligns Vision with Values and gives employees the tools within themselves to create greater self awareness and consciousness in the work environment. Margaret was insightful, energetic and kept the group informed and interested. The stories about how design has influenced the environment and history of the location were very interesting. ​A unique experience and not one I'll not forget. 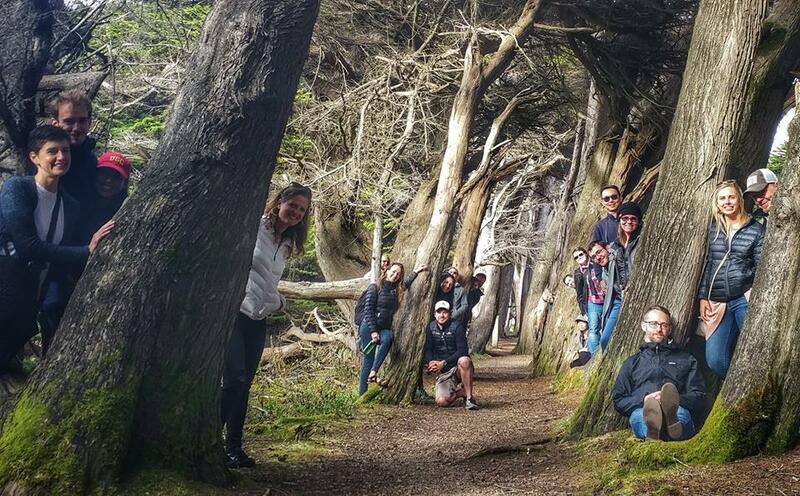 Team Zendesk Managers on Tour to kick off their Brain Storming Retreat Week. "Margaret's Yoga gives me the boots to walk my own path!" Learn techniques to help you push through and release the subconscious blocks that impede your inner growth. Learn more about the details and specifics of our class & workshop outlines below. Margaret's ALL LEVEL yoga classes begin with a fusion of Kundalini & Vinyasa Flow warm up exercises that then blend seamlessly into a fine-tuned "teamwork" of Kundalini exercises called a "Kriya". Kriyas are an ancient "recipe" of exercises designed to for a specific outcome or goal. This is followed with a powerful Meditation or Breath technique, deep relaxation & crystal bowl sound therapy to close the class. Guests feel vibrant, buoyant, unburdened and connected powerfully within themselves. and transformative inner healing and evolution. The most common feedback we receive about our classes & workshops says it all and inspires us to continue to aim higher. "That was a game-changer for me, thank you!" With Kundalini I found that for the first time in my life I wasn't just "muscling" through a practice, I was opening an inner door to a boundless potential of self awareness and manifestation. What's more: the ancient wisdom of Kundalini and its unique applications make the practice available for anyone on all levels and can be tailored to meet the needs of the individual or group. Our yoga sessions engage participants in a dynamic blend of physical postures, breath, movement, meditation and mantra, which activates the glandular system, strengthens the nervous system, expands the lung capacity, and purifies the bloodstream. Most importantly, it builds inner strength and self-awareness to reach your highest potential. You will discover how to unleash and strengthen the mental, physical and nervous energies of your body! A TYPICAL 1 HOUR CLASS LOOKS LIKE THIS: We begin with a tune-in mantra to set our intention for the class followed by a series of warm up & flow exercises that then move into a Kriya. A Kriya is a carefully crafted "teamwork" of exercises (or recipe of exercises) and breath techniques designed to meet a specific physical and mental goal. We then rest to allow the energy created to penetrate and distribute itself throughout the body. This is followed by a brief meditation or mantra depending on our customization for you or your group. Class will finish with crystal bowl sound therapy and a tune-out mantra to seal the work. The primary objective is to awaken the full potential of human awareness in each individual, to recognize and refine that awareness, and expand upon it to your highest potential. Our Kundalini yoga sessions work to clear any inner duality, to create the power to deeply listen, to cultivate inner stillness, and to prosper and deliver excellence in all that you can do. From Yoga to Tours that emphasize the systems in Nature, OR combinations of both to encompass all connections We tune it for you! We customize the perfect tool kit for cultivating success for your professional retreats or workshops. We create a safe, comfortable environment for employees, managers, and CEOs alike and provide effective modalities to achieve the most from your team building retreats. We work with you to create a class dedicated to providing you the necessary tools for practicing Conscious Business. When we practice business consciously, we make better decisions based on a fuller understanding of all the facts, undistorted by personal agendas. Ultimately, the clarity that comes with conscious business practices leads directly to greater personal satisfaction from work! Our workshops and classes provides practical advice on how you can increase the level of consciousness you bring to your own work right away! Thinking outside the Box - Removing the blocks! Booking your Corporate Retreat at the Timber Cove Resort? Ask about our services and package pricing. A wonderful location for yoga (as shown) and work retreats! Emotional, Empowering and Powerful! Margaret's Intention Workshop was so much more than expected! It brought our work retreat to a much higher level giving all our team members the opportunity and tools to help clear the mind, release stress and to understand how mental clutter can skew our vision to become greater than we are. We cannot imagine this Workshop not being a part of our Retreat Work and glad we made the choice to have Unbeaten Path not only open our retreat but to close our opening day as well! The Team all came together as one and was completely revitalized and focused! THANK YOU, UNBEATEN! Our workshops and retreats are tailored to guide you in discovering the areas of your life you wish to empower and elicit positive change. Physically, it will rejuvenate & restore the body from a cellular level - up. It will boost your metabolism, oxygenate the cells, promote glandular health, strengthen the nervous & muscular systems, balance the brain hemispheres, and more. In addition, Kundalini helps you to go deep into the intuitive you, helping you hone in on your natural skills, abilities and true calling. Feel happy, healthy and fulfilled and discover your potential to be more productive, creative, and relaxed! Specifically geared classes and workshops help to transform your life, your relationships, boost your energy levels and overall physical well being. Want to get away and have an all-in-one WELLNESS EXPERIENCE? ​a spectacular location for touring, tide pooling and yoga! and a great resource for your visitor needs! See their link provided for more details! Let us know and we will come to you! Today’s Western definition of yoga is limiting, describing a specific type of exercise. But to the ancients, yoga was a sacred spirit-body connection. Their goal was not fitness. It was direct connection with Brahman, the spirit within us. No religious buffer between man and God was considered necessary. Just practice. Of the many yogas that developed over the past 5,000 years, Kundalini was considered the most sacred. The exact origin of Kundalini Yoga is unknown, but the earliest known mention dates to the sacred Vedic collection of writings known as the Upanishads (c. 1,000 B.C. - 500 B.C.). Historical records indicate that Kundalini was a science of energy and spiritual philosophy before the physical practice was developed. The word “upanishads” literally translates to “sitting down to hear the teachings of the master.” The first Kundalini classes were just that. Masters sat down with students and gave oral recitation of spiritual visions. This was a popular practice in ancient Vedic society. Over time, the body science of Kundalini Yoga was developed as a physical expression of the Upanishad visions. From its origin, Kundalini Yoga was not taught publicly. It was treated as an advanced education. Students were required to go through several years of initiation before they were prepared to learn the spirit-body lessons of the Kundalini masters.